In our research, we have focused on investigating the application of brain-inspired technology by developing a robot with consciousness resembling that of a human being. The goal was to enhance intelligent behavior/emotion, and to facilitate communication between human beings and robots. We sought to increase the robot’s behavioral/emotional intelligence capabilities so that it could distinguish, adapt and react to changes in the environment. In this paper, we present a behavioral/emotional expression system designed to work automatically by two processes. The first is a classification of behavior and emotions by determining the winner node based on Self-Organizing Map (SOM) learning. For the second, we propose a stochastic emotion model based on Markov theory in which the probabilities of emotional state transition are updated with affective factors. 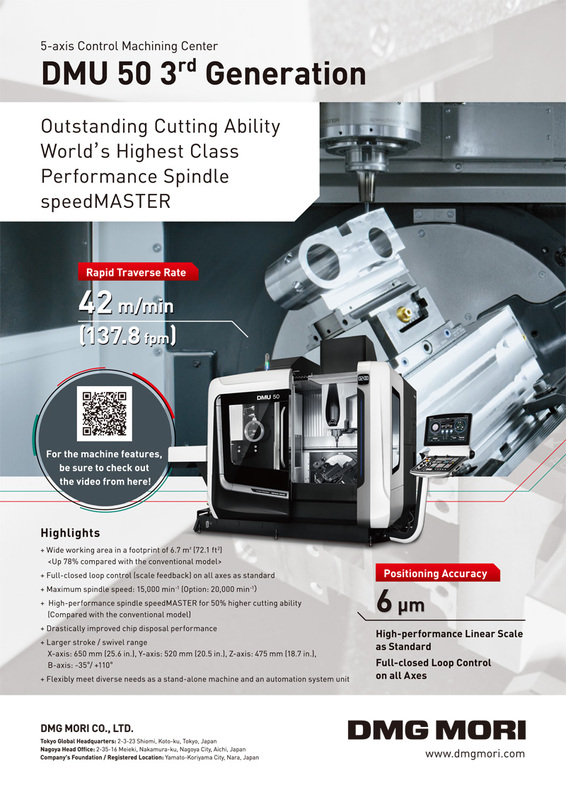 Finally, we verified this model with a conscious behavior robot (Conbe-I), and confirmed the effectiveness of the proposed system with the experimental results in a realistic environment. 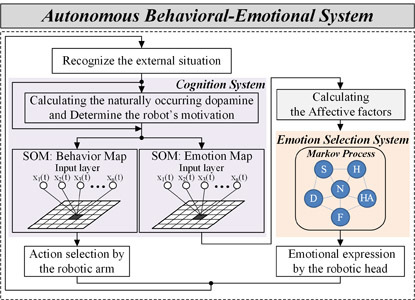 W. Jitviriya, M. Koike, and E. Hayashi, “Emotional Model for Robotic System Using a Self-Organizing Map Combined with Markovian Model,” J. Robot. Mechatron., Vol.27, No.5, pp. 563-570, 2015. S. Kiesler and P. Hinds, “Introduction to this special issue on human-robot interaction,” J. of Human-Computer Interaction, Vol.19, No.1, pp. 1-8, 2004. C. Breazeal, “Function Meets Style: Insights From Emotion Theory Applied to HRI,” IEEE Trans. on Systems, Man, and Cybernetics, Vol.34, No.2, pp. 187-194, 2004. T. Fong, I. Nourbakhsh, and K. Dautenhahn, “A Survey of Socially Interactive Robots,” J. of Robotics and Autonomous Systems, Vol.42, pp. 143-166, 2003. Y. Mori, K. Ota, and T. Nakamura, “Robot Motion Algorithm Based on Interaction with Human,” J. of Robotics and Mechatronics, Vol.14, No.5, pp. 462-470, 2002. J. McCarthy, “Making robots conscious of their mental states,” Machine intelligence, Oxford University Press, pp. 3-17, 1996. N. Goto and E. Hayashi, “Design of Robotic Behavior that imitates animal consciousness,” J. of Artificial Life and Robotics, Vol.12, pp. 97-101, 2008. E. Hayashi, T. Yamasaki, and K. Kuroki, “Autonomous Behavior System Combing Motivation with Consciousness Using Dopamine,” Proc. of 8th Int. IEEE Symposium on Computational Intelligence in Robotics and Automation (CIRA), pp. 126-131, 2009. J. Moren and C. Balkenius, “A computational Model of Emotional Learning in the Amygdla,” J. of Cybernetics and Systems, Vol.32, No.6, pp. 611-636, 2001. M. Obayashi, T. Takuno, T. Kuramoto, and K. Kobayashi, “An Emotional Model Embbed Reinforcement learning System,” IEEE Int. Conf. on System, Man, and Cybernetics (SMC), pp. 1058-1063, 2012. A. Ortony, G. L. Clore, and A. Collins, “The Cognitive Structure of Emotions,” Cambridge University Press, 1988. Q. Xu, L. Zhou, and F. Jiao, “Design for User Experience: an Affective-Cognitive Modeling Perspective,” IEEE Int. Conf. on Management of Innovation and Technology (ICMIT), pp. 1019-1024, 2010. N. Kubota and S. Wakisaka, “An Emotional Model Based on Location-Dependent Memory for Partner Robots,” J. of Robotics and Mechatronics, Vol.21, No.3, pp. 317-323, 2009. H. Löovheim, “A new three-dimensional model for emotions and monoamine neurotransmitters,” J. of Medical Hypotheses, Vol.78, pp. 341-348, 2012. R. Plutchik, “Emotion: Theory, research, and experience,” Theories of emotion Vol.1, Academic, 1980. S. C. Banik, “A Computational Model of Emotion and its Application to a Multiagent Robotic System,” Thesis, Department of Advanced Systems Control Engineering, Saga University, Japan, 2009. Y. Yamazaki, F. Dong, Y. Uehara, Y. Hatakeyama, H. Nobuhara, Y. Takama, and K. Hirota, “Mentality Expression in Affinity Pleasure-Arousal Space using Ocular and Eyelid Motion of Eye Robot,” Proc. of 3rd Int. Conf. on Soft computing and Intelligent Systems and 7th Int. Symposium on advanced Intelligent Systems (SCIS&ISIS), pp. 422-425, 2006. H. Kimura, “A trial to analyze the effect of an atypical anti-psychotic medicine, risperidone on the release of dopamine in the central nervous system,” J. of Aichi Medical University Association, Vol.33, No.1, pp. 21-27, 2005. T. Kohonen, “Self-organized formation of topologically correct feature map,” J. of Biological Cybernetics, Vol.43, pp. 56-69, 1982. T. Kohonen, “Adaptive, associative, and self-organizing functions in neural computing,” J. of Applied Optics, Vol 26, pp. 4910-4918, 1987. M. Herrmann, “Self-Organizing Feature Map with Self-Organizing Neighborhood Widths,” Proc. on IEEE Int. Conf. on Neural Networks, Vol.6, 1995. A. Flexer, “Limitations of self-organizing maps for vector quantization and multidimensional scaling,” Technical Report oefai-tr-96-23, The Australian Research Institute for Artificial Intelligence, 1997. J. A. Russel, “A circumplex model of affect,” J. of Personality and Social Psychology, Vol.39, pp. 1167-1178, 1980. K. Kolji and B. Martin, “Towards an emotion core based on a Hidden Markov Model,” Proc. of 13th IEEE Int. Workshop on Robot and Human Interactive Communication, pp. 119-124, 2004. K. Inoue, T. Arai, and J. Ota, “Behavior Acquisition in Partially Observable Environments by Autonomous Segmentation of the Observation Space,” J. of Robotics and Mechatronics, Vol.27, No.3, pp. 317-323, 2015. A. Mehrabian, “Framework for a comprehensive description and measurement of emotional states,” J. of Genetic, Social, and General Psychology Monographs, Vol.121, No.3, pp. 339-361, 1995. M. S. EI-Nasr, T. Ioerger, and J. Yen, “FLAME: fuzzy logic adaptive model of emotions,” J. of Autonomous Agents and Multi-Agent Systems, Vol.3, No.3, pp. 219-257, 2000. H. Ahn, P. Kim, and J. Choi et al, “Emotion head robot with behavior decision model and face recognition,” Proc. of Int. Conf. on Control, Automation and Systems, pp. 2719-2724, 2007.